What a wonderful 4th of July it's been!! I'm so happy my husband got to grill early, because about the time we sat down we had one heck of a thunderstorm come through. We even sat in the dark to eat because of all the lightning ~ we had everything unplugged!! 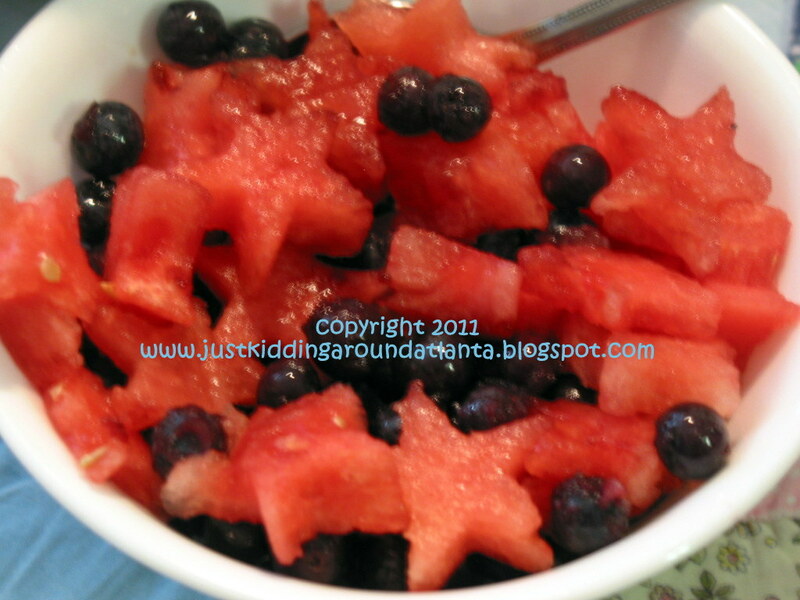 I cut a wedge of watermelon into thin slices, then used a small star cookie cutter to make star-shapes. Tossed with some frozen blueberries for a yummy side dish! I had a scrap of stars/stripes fabric, so I cut it into a couple of rectangles to line bowls/baskets, then tore several squares for napkins. I wrapped a fork & spoon inside each, and tied them with red raffia. 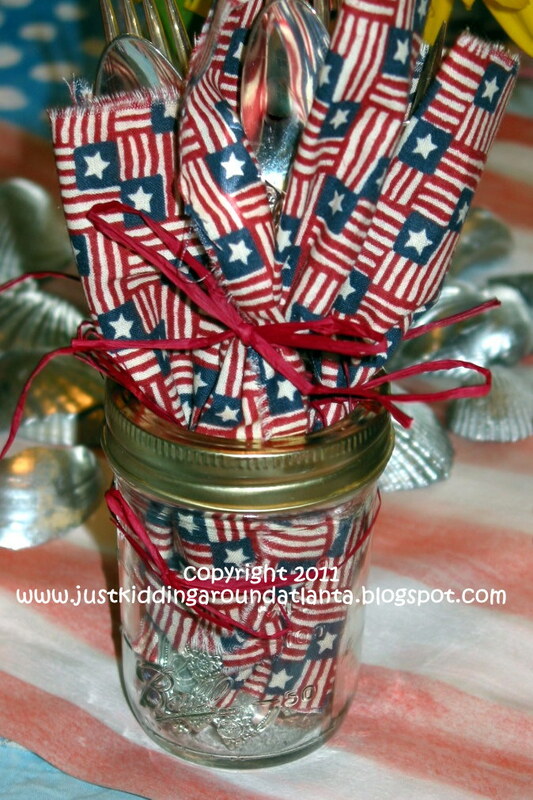 I placed them in a jelly jar with a small raffia bow. Last week, the kids got on an artsy-crafty kick. 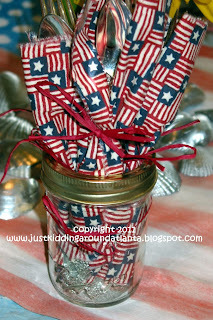 They made the American Flag drawing under my silverware jar, and also one for the coffee table (we ate in the living room together today!). Here's a pic of the serving table! I covered it with a favorite vintage quilt, the kids' flag picture, a mason jar with some of the sunflowers (should have been in the sunflower house, but it would only have 3 walls, lol), and some of my silver shells! I wanted a country/beachy/summer-y feel to my tabletop. buffalo chicken breasts (destined to become a buffalo chicken pizza, salad or sub one night! ), baked potatoes (For an easy vegetarian supper), and veggie/chicken kebobs for tomorrow night. 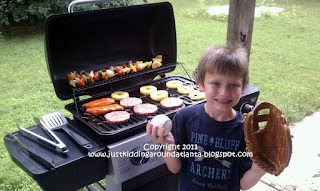 Here's a pic of my cutie patootie down by the grill, helping his daddy. Here's what I made for dessert. I'll tell you what, I'll definitely change some things the next time I make it. It was good, but would be even better with a tweak or two! 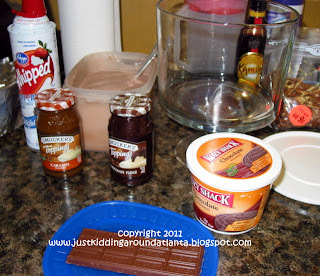 I came up with this recipe because A) I love making trifles in my Pampered Chef Trifle bowl B) I had leftover pudding from Katie's recovery and C) I had several of these Smuckers toppings that I got on sale for 34 cents each at Publix & I was dying to use them in something delicious! : ) Plus - how can you go wrong with chocolate, coffee & caramel in one dish?! Hope you enjoy! 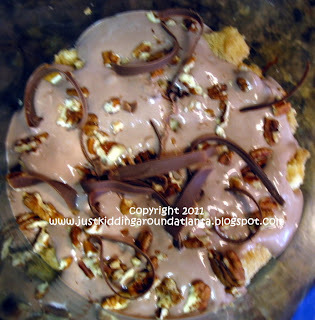 After you cut the dessert shells, place in a bowl, pour the coffee over them and toss a bit to soak all of the pieces. In large bowl, mix whipped cream, pudding, and Kahlua. Set aside. In trifle bowl or serving dish, layer 1/3 of the dessert shells, followed by 1/3 of the pudding, 1/3 of each of the sauces drizzled on top, 1/3 of the pecan pieces, and 1/3 of the chocolate bar shaved on top. Cover & chill for several hours before serving. Yum, yum, yum!!! 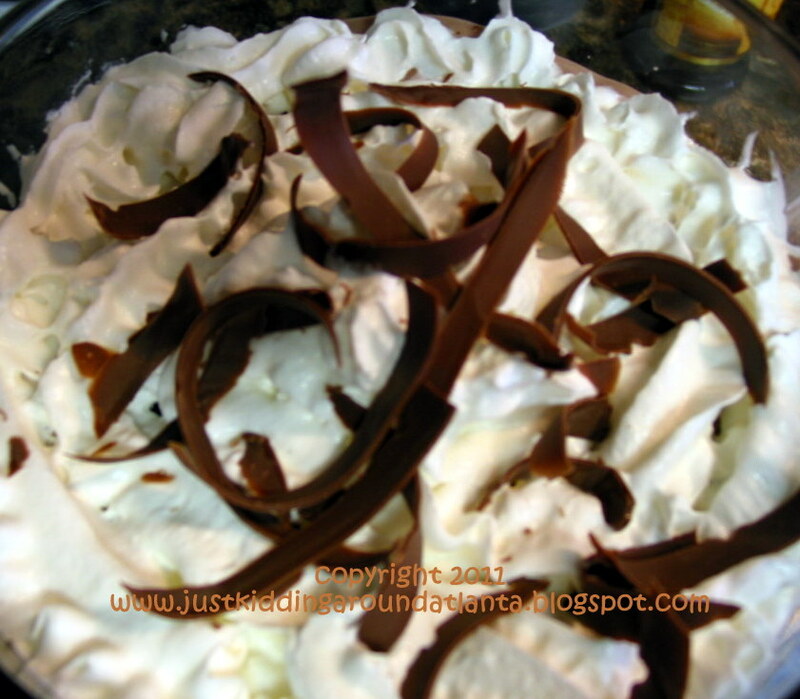 You can see how high the whipped cream was originally, because it left a line all around the trifle bowl.....wahh! It wasn't what I expected when I brought it in to serve! Sad looking. But guess what? Still so freakin' delicious!! Reminded me of Tiramisu with the coffee soaked cakes in there - mmmmm. So next time I make this, I'll change a few details (look for the NEXT comments in the recipe to see my changes) and hope to get a prettier result. 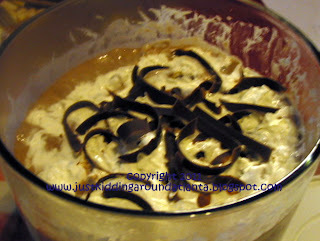 I think using whipped cream will give the pudding/cream layer more volume - this batch was kind of liquid-y. But I honestly don't think the taste could be improved upon - it was awesome! 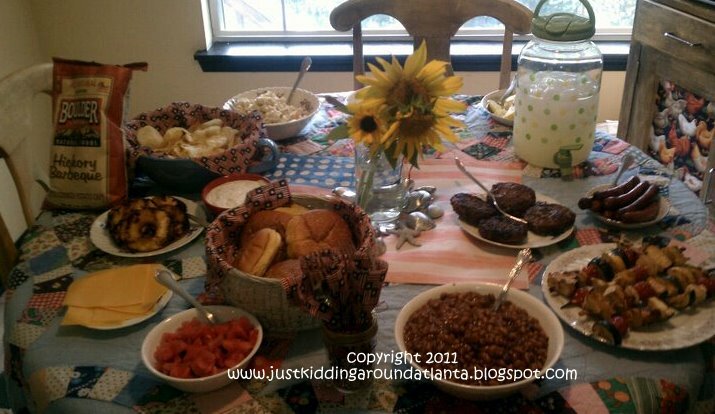 So what did you serve up for the 4th of July? Hope it's been a grand day for y'all too! God Bless America ~ we live in a wonderful place!! buffalo chicken breast soon to be pizza!? yes, please! leftovers are the best, aren't they. that dessert looks deelish, too!